The Countdown supermarket chain said Sunday the Choice brand has been withdrawn from stores "as a precautionary measure." Countdown is also advising customers to cut up strawberries before eating them. The chain said no illness or injury has been reported in New Zealand. Countdown is working with New Zealand and Australian authorities. "At Countdown we take food safety very seriously and we have withdrawn any remaining Choice strawberries from sale from Countdown, SuperValue and FreshChoice supermarkets while we investigate this with our suppliers," the chain said in a statement. The announcement comes after at least 100 reports of needles being found in strawberries in Australia last week. 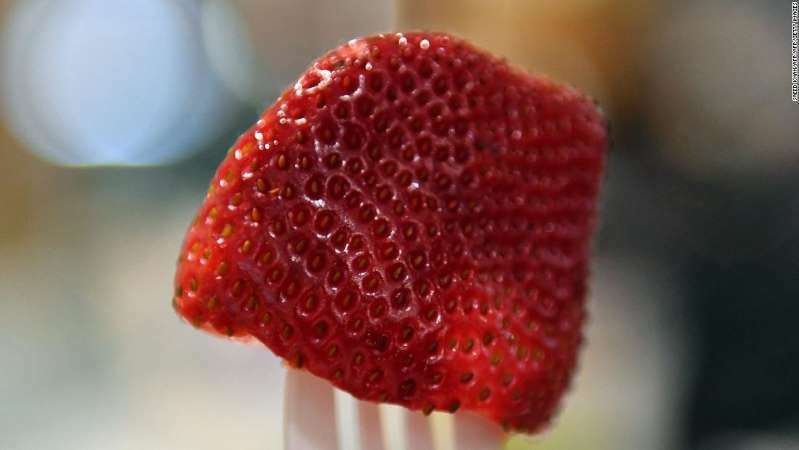 Sewing needles and pins have been found in all six Australian states, in at least six brands of strawberries. The needles have caused panic in Australia and neighboring countries. "It's not a joke. It's not funny. You're putting the livelihoods of hardworking Australians at risk and you're scaring children," Prime Minister Scott Morrison said Wednesday. "You're a coward and you're a grub, and if you do that sort of thing in this country, we will come after you." The Australian government has ordered a federal investigation.